"French sports management students share Wrigley Field lessons"
Some Chicagoans wouldn’t advise foreign graduate students to visit Wrigley Field in order to learn about sports marketing. Do they know about the rooftop-billboards standoff, bigger stadium restaurants and more parking? Controversy notwithstanding, 20 French business students recently spent the day watching a Wrigley baseball game, but were more interested in seeing how the Cubs promoted the team and the Friendly Confines as big business. Days later, Glenview’s Vi retirement village invited the students to come discuss their impressions of Chicago and the many businesses they will visit on a 30-day learning excursion. The Seagull Institute in Chicago organized the tour, and students lived in housing at Roosevelt University. An international company, the institute plans educational seminars for French and American students in Paris and Chicago. Programs are in sports management, marketing, communications and advertising. These students were in Chicago to learn about sports marketing, having observed the strategies of the Chicago Cubs, Bears and especially the Bulls, thanks to Michael Jordan. In contrast to America, looking upon the country’s sports teams as big profit ventures is “taboo” in France, explained student Roch Francois. He and fellow classmates said making money from teams was considered irresponsible in their country, and would make sports feel impure for citizens. Francois, 22, also said alcohol and food were not sold at professional soccer matches. “But Americans eat food, watch the TV and buy souvenirs at games. In France we can only watch. Big cultural differences between France and the United States,” he said. Fellow student Lucas Prodo, 22, said his country recently lost bids three times to host the International Olympic games. “But we’re not good at organizing big sports, not yet. The Wrigley Field experience was nothing like France,” he said. For instance, Prodo noted Cubs advertising posters inside and outside during his elevated train trip to Wrigley Field. Other students said French sports companies do not sell teams through stadium entertainment, such as half-time shows, music and electronic animation. Seagull founder Jonathon Broutin has lived in Chicago for eight years, and in 2006 he accepted a position with the Bank of America Chicago Marathon as director of international and community relations. “Our seminar here for the French students helps them compare and contrast the practice of sports management as a business between our two countries,” he said. Broutin said the students will also visit Chicago churches, McDonald’s headquarters in Oak Brook and several businesses during their trip. "Seagull Institute brings their 3 month tour to a close with a visit from our CEO." "Seagull Institute, a French educational organization based in Chicago, IL has hosted French students to visit our great city and become immersed in our culture as a major city for enhancing business acumen. Their 3 month journey in Chicago has indeed been an eventful one admiring our music, arts, and architecture. With 10 days left, it was a honor for them to end their trip to Chicago with a tour of 1871 and also meeting Founder/CEO of LocalLux Randy Ellis. For a 30 minutes session, the group covered topics from how to build your team to bring an idea into fruition. 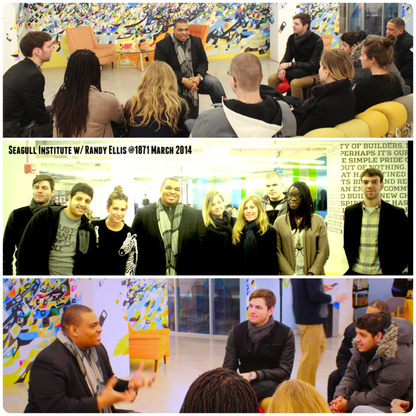 Randy encouraged the students that if they want to practice entrepreneurship, Chicago is the city to do that in! We hope to continue to build a great relationship with the Seagull Institute and wishing every student the best of luck on their career path. À la prochaine fois! Merci à tous." "Tech students selected to work with international educational program." "Although they have never traveled the 1,200 miles to Chicago, nine Texas Tech public relation majors had the chance to help create a public relations firm for the Seagull Institute located in the windy city. The students were selected from graduate instructor Patrick Merle’s campaigns class to work with the Seagull Institute in Chicago. Merle recommended Chase Darnell, Casey Lewis, Terez Barbaro, Libby Verret, Manuel Ramirez, Megan Shudde, Kayla Lara, Jennifer Powell, Sarah Lebus to Jonathan Broutin, the founder and CEO of Seagull Institute, which is an international education program. The students competed with students from Chicago and were selected based on media relations, social media, and digital marketing skills, he said. Merle said working as a public relation firm helped the students learn to use technology, such as email, as a resource for long-distance jobs. Broutin graduated from the University of Paris II with a master’s degree in marketing and communications in 2001 and founded the Seagull Institute in 2011, according to the Seagull website. The institute is an international study abroad program that gives students an opportunity to learn about marketing and business in Paris and Chicago. Public relations undergraduate students have been working as Seagull’s public relation firm for three months as needed for development of the organization and communicate often with Broutin via Skype. Verret said she has learned time management skills, which were important in preparing for a real-world career. One of the reasons the experience was unique and exciting, Verret said, was because the students had the chance to build the firm from the ground up, while typically, students work with pre-existing companies. Merle said the purpose of the educational institute is to create a bridge of understanding between the French and U.S. media. His goal, he said, is to bring French students to America and send American students to France to learn marketing, strategic communication skills and learn about the culture of the country. Along with learning to work as a firm, Merle said the students developed a professional relationship with Broutin, which required time and effort outside of the classroom. Verret said the students were separated into sections and work in media relations, video, blogs and social media strategies. “We oversee strategy and get the word out for the institute in America,” she said. Merle said the students were given specific tasks, which matched their interests and skills. Verret said the opportunity was a chance to get her feet wet for finding a job after she graduates."